well, Jax, just for you, here’s the saga so far! No pics yet, we are short of a camera at the moment and the one on my phone is a bit rubbish. The first think I have to say is that when printing patterns, espeically patterns from the US, where paper sizes are different, be very careful what options are checked in the printer settings…… the one you want is “none” cos if you have anything else checked it WILL all end in tears. Trust me. Anyway, once printed you then spend an evening cutting and sticking like a blissfully happy toddler (but hoepfully a little more accurately) and finally you have your pattern pieces assembled, on nice sturdy paper rather than that thinnest of teh thin tissue paper that “real” patterns come printed onto. This is good. Now, I’m not usually one who studies instructions all that carefully. I’m a visual kind of girl, and usually I can look at the bits and see how it all goes together. 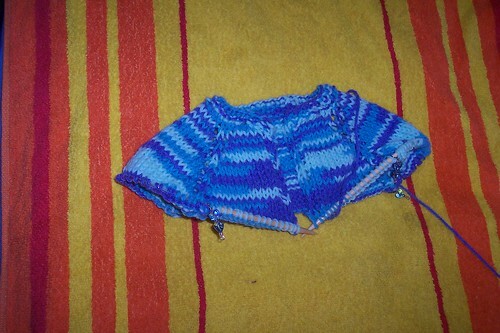 But this was a new sort of pattern to me so I was a good girl and followed the instructions to the letter. Hmmm, not sure I’ll do that again in a hurry although to be fair, it was useful just this once so I could get a feel of how it works. The instructions say to turn the hems at the neck and sleeves before you join the garment together at those points, leaving an inch or so unsewn at both ends to give a gap to thread the elastic through. I tried this on Trial 1 (Aprilia’s) but really feel that it made for a much bigger faff later on as then you were trying to join seams with the fabric already trying to fold over at the ends rather than laying flat. For Trial 2 (mine) I did it my way, sewed all the seams up first then rolled the hems over and sewed them down (leaving a much smaller gap to slip the elastic through) and this felt like less fiddling to me, although i accept that that may be down to me and my odd way of working rather than the patterns fault!!!!! I did quite like how the casing for the elastic at the waist came together, although it is a bit bulky and I think i can work up something better with a bit of thought and patience, more on that when I get the light bulb moment! And eventually I decided not to elasticate the sleeves as they look quite nice as they are. So, what to do differently? I wouldn’t turn the hems like they say, it’s just as easy to turn them after the garment is put together and I think it ends up neater that way. I wouldn’t zigzag every raw edge, it makes them rough, I don’t like rough scratch bits in my clothes! I’ve top stitched them down on Trial 2 and that looks fine, will stop any fraying and isn’t scratchy. Jax, will do a pic so you see what I mean. I wouldn’t zig zag the hems then turn them, on Trial 2 I turned the hem with a zigzag stitch, it holds it down and stops it fraying at the same time, as they are going to have elastic threded through them it doesn’t matter that they aren’t pretty neat little striaght stitches, they will be lost in the fabric gathering and will lay much flatter than doing 2 seperate lines of sewing. I’m wondering about using the kind os seams you get on jeans (tent seam?) at the waist to reduce the bulk but still give me a space to tread elastic round. I think it would look really lovely with a “twirl skirt” or really full gored skirt rather than the very straight one that the pattern calls for, would match better with the fullness of the top part and make for a really lovely cool floaty summer dress. So, that’s what I’m going to do on Trials 3 and 4 really isn’t it! This was a bit of a challenge as I didn’t have a pattern that fitted what I wanted so it really was a “from scratch” arrangement. 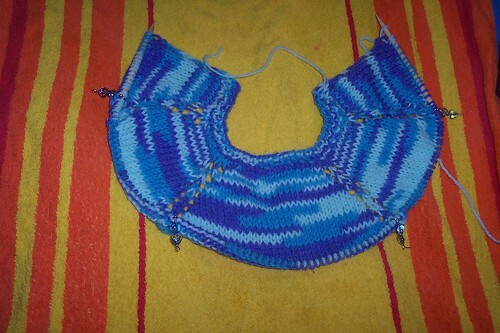 It’s worked from the neck down, I cast on “provisionally” so I wouldn’t have a tight cast on at an area you want a bit of give, increasing for the “raglan” every other row until it was deep enough (gee, how un-specific can you get!) then I made an extra 10 sts for give under the arms and carried on downwards just on the body sts, leving the sleeve sts on waste yarn. I put a bit of shape into the sleeves by decreasing 2 every couple of rows at the underside (I did them in the round to save me sewing up later so the decs served as a “fake seam” too) Once that was done I retrieved the sts from the provisional cast on and increased round a few times to bag the hood out a bit. Did a sort of “Dutch heel” affair for the top to make it a bit more head shaped rather than the standard rectangle folded in half so you get a “pixie point” which would just look silly! I was pressured to fit a zip rather than buttons so I did and quite frankly I don’t like it! But it’s not mine so it’s not my preferences that matter. as if my to do list isn’t long enugh already, I thought I’d find a crochet cardi link for a friend and got way too carried away! So, erm, Jax, here’s a few cardigans etc, maybe there’s something Big would aprove of you wearing 😉 and if I ever find enough hours in the day I’m making some of these too! http://www.berroco.com/exclusives/cali/cali.html – long-ish wrap around, not sure about the roses on the belt mind you! http://www.yarnsplus.com/crochet/cardigan.htm – you’ll either love it or hate it! Should I admit to liking these sorts of geometric designs? Cuz I do! http://crochetme.com/patterns/ballet-sweater – sleeveless wrap around. Looks quite pretty, may do this for Aprilia if I thought for one moment that she would wear it! http://cache.lionbrand.com/patterns/70258A.html – long flowing afair, not sure I like their colour but I like the design. http://www.caron.com/projects/ss/ss15_rose_cardigan.html – short, delicate affair. 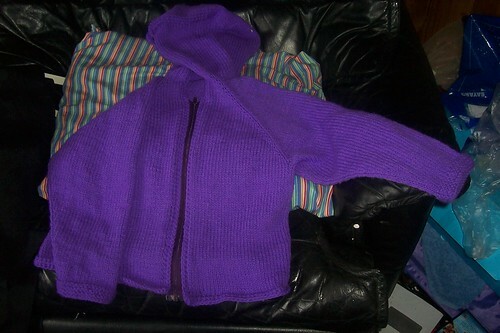 http://www.bernat.com/pattern.php?PID=2401 – okay, so this is a pullover but change the pattern to just do the front in 2 halves and it would be a great hooded cardi. http://www.caron.com/projects/emb_cro/ss_ek_kimono_shrug.html – can’t imagine this is smart enough for what you want Jax but it looks really cosy in a sort of pull it on as it goes chilly at camp sort of way! Cute buttons and a zip to match yarn colour. I used a provisional cast on to keep it nice and stretchy at the top and to make picking up for the neck and sewing the arm seams neater. You don’t need to if you don’t like. There’s not a lot of stitch counts given as I forgot to note them down, I worked visually without counts for most of it and it worked fine. K34, slip 1, k2 tog, psso, K86, slip 1. k2 tog, psso, k34. Work 3 rows without shaping but be sure to carry your markers over each row, you still need them. Work 1 increase at either side of both markers on alternate rows until you have around 114 stitches (again, it probably won’t be exact!) 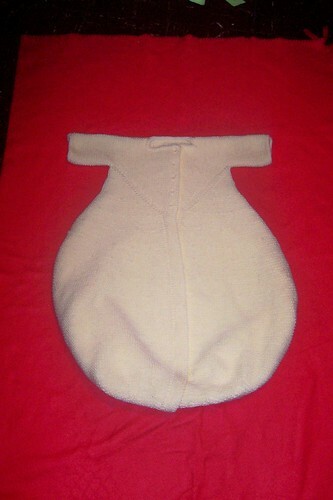 then increase 10 stitches evenly across your centre section to give a little fullness around the middle of the bodice. At about 158 stitches, slide the outer sections onto waste yarn, you won’t need them for a while now, and increase 1 stitch every 4 across the middle section. Continue working with just the middle stitches, increasing 1 st every 5 (then 6, 7, 8..) sts on every 10 rows until it looks nice and wide – I went up to nearly 300 sts which was too many really but hey ho! Continue working striaght until work is about 30″ long then decrease 1 st every ?? sts (?? is going to be different for everyone, basically, if your last increase was every 8th st then start by decreaasing every 8th, then every 7th on the next one etc) every 4th row. Once you are down to around 40 sts, you are pretty much done. If you don’t like Kitchener stitch then cast off all except the centre 6 sts., if you do weaving/Kitchener etc then weave all bar the centre 6. Keep those 6 on a holder. Button Bands – With the first of the centre sts on your needle, knit up one of the fronts of your piece, collecting the sts at the front of the bodice which you left behind earlier. Work back and forth on these sts, collecting one of the centre sts and knitting it toghether with the st next to it at the beginning of each row starting at the bottom. (Note – if possible, keep a waste thread through those 6 sts as you want to pick up through them again for the second band) Work until 5 sts are used (5 ridges, 10 row), cast off on your way back down towards that 6th st, joining it in on your last cast off st.
Repeat for the other side of the button band, working into your 6 marked stitches (which I usually slip onto a needle to make them easier to find) This side will sit on top of the one you have finished and so needs the buttonholes placing in it. I worked a Yfwd, k2tog starting at the neck edge of the 5th row roughly every 5 sts but only for the bodice part – the skirt part is zipped. Finishing – Close the shoulder and arm seams either by sewing or weaving if you prefer. Wrok I-cord round the cuffs (gives a nice finish) Work I-cord round the neck. Sew buttons onto bodice. Sew a long zip into the button band along the skirt. Just got pointed to these and thought I’d blog them before I lost them! having abandoned the thing I’m mean to draw next for lack of a decent subject (leaves, there’s a distinct lack of them round here….) 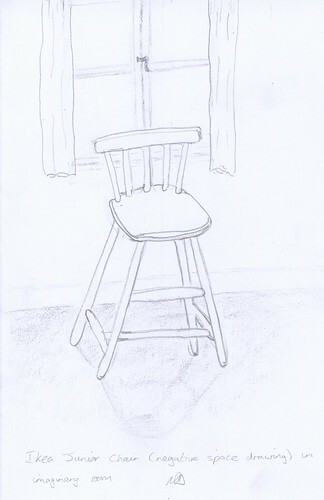 I moved on to first a copy of a photo of a chair then the real thing. 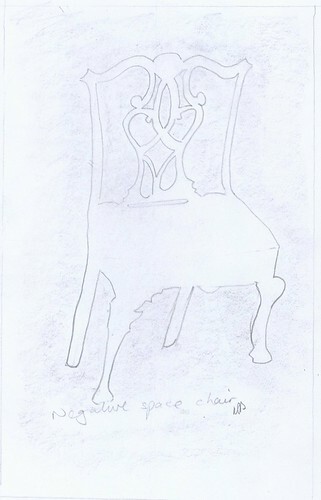 The one from the photo is a “negative space” drawing, so you sort of draw the space that would be left if you took the chair out of the picture rather than drawing all the details, the other one I doodled a background into to make it mor interesting, anyone who has been to my house will know we don’t have picturesque little windows like that! and we don’t have that much clear floor either!!! 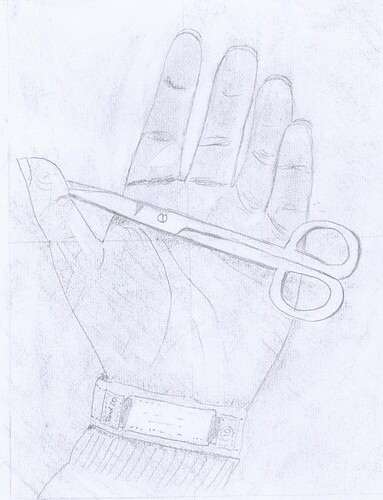 the next few drawing tasks have been a challenge, mainly as the intended subjects weren’t available! First was to be a flower with a few leaves etc which, being autumn, are in short supply in my back yard (so I resorted to a plastic one which looked as unspeakably awful in real life as it did on the page!) then it was a half peeled orange which, being as today should have been shopping day but we didn’t make it, I didn’t have either! So I drew the back of the aforementioned pastic flower! there is a lot to be said for drawing things you actually like…. drawing ugly plastic just because it’s about the right shape for the excercise is crap, you can’t enjoy looking at it so you can’t enjoy doing it or feel good about what you produce. Hmph.